It’s hard to believe that Thanksgiving is already upon us; maybe it’s the fact that the holiday comes early this year, but I was astounded to realize on Monday that it’s Thursday of next week. Yikes! If you’re as shocked as I am at the proximity of Thanksgiving, and wondering what the heck you’ll serve to guests this year, fear not: I’ve got you covered. 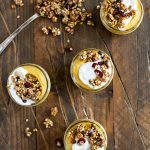 Today on Food52, I’m giving you my favorite tips and tricks for a totally meat, dairy, and egg free Thanksgiving feast, from side dishes to dessert. And at the center of the post is my personal favorite Thanksgiving recipe: butternut squash, brussels sprout, and bread stuffing with apples! The recipe is based on one of my two vegan stuffings from last year. I made it more inclusive in terms of bread options (sourdough and whole wheat are fine for non-GF folks) and added apple and some fresh herbs. I think it’s even better than the original—a hearty, sweet/savory, delicious dish—and I hope you will, too. Head on over to Food52 to check it out!!!! Gena this is absolutely gorgeous – wow! Beautiful images and stellar ingredients. Happy early Thanksgiving to you! It looks delicious! I have had stuffing on my mind lately. BEAUTIFUL recipe! I am helping my mom with Thanksgiving this year and will definitely be adding this to the list! Yesss! Thanks for this little menu to choose from. 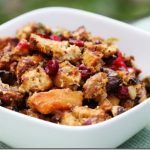 I love stuffing too, so I always try to wow the guests with a really great vegan one. And I love Brussels Sprouts. This looks beautiful and delicious! I’ve been seeing brussels sprout recipes everywhere lately- gotta give them a try! Ha! 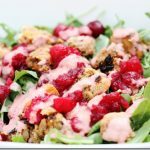 I just made last year’s version of this stuffing this week! I actually used a failed cornbread attempt in place of some of the bread, and thought about adding apples, but not until after I’d popped in in the oven. Thanks for revisiting your oldies but goodies! beautiful spread as always! i have really been taken with roasted brussel sprouts this fall—trader joes has been selling them on the stalk and i have been taking full advantage…even if they awkwardly fit in my fridge 🙂 i swear thanksgiving came out of nowhere this year! Just left whole foods with all the ingredients for this! And now I’m eating the leftovers. I used the Food For Life millet bread, and result is excellent. Decided- this is the stuffing I’m making. Bought the ingredients today. Excited for the (nowhere near vegan) family to try it. Again, Gena, you are fantastic! 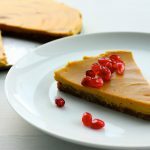 I included this yummy looking recipe in my Thanksgiving Recipe Round-Up this year – Keep up the good work! blog and was wondering what all is needed to get set up?